GamesIndustry.biz: My next question was are you looking at working with other publishers and other formats? Nina Kristensen: Yes, our new game is going to be PS3 and Xbox 360. We have actually signed it but we're not announcing to who at the moment. Seeing how I gave you no intro or information about that tidbit whatsoever, let me explain. Nina Kristensen is the co-founder/chief developer of Ninja Theory, the masterminds behind Heavenly Sword, and that quote you just read? Yeah, that's what you're gonna see from Heavenly Sword 2, multi-platform goodness. I wonder if there will be a slight fanboy dispute about this one, Sony-heads whining because they lost an exclusive while M$ followers laugh out loud at the Sony's loss. You can read the whole interview after the break, or in it's original format at GamesIndustry.biz. 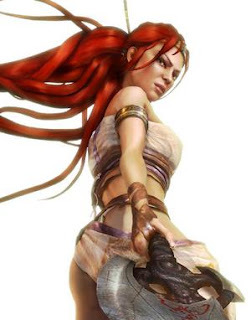 Q: GamesIndustry.biz: Can we start by quickly looking back at Heavenly Sword. There was quite a lot of build up to the release of the game but after release did you get good feedback from Sony and from retail? Nina Kristensen: We did. We're really proud of what we were able to achieve and we did some breakthrough stuff, particularly in the story-telling and cinematics and we were able to work with some absolutely incredible people like Andy Serkis. We were able to pioneer the performance capture and so forth. So the reception for it has been absolutely brilliant. Q: GamesIndustry.biz: Did you find that Serkis understood what you needed from him from a games development point of view, and did you get a better understanding of the acting and film business from that relationship? Nina Kristensen: As a person to work with you couldn't ask for better. He's extremely professional and really knows what he's doing. Andy had never worked in games at all and I don't think he'd ever played a game when he first came on board. It was really interesting to him because he's seeing a media that he hasn't worked in before and saw some big opportunities to push his craft forwards. He was able to bring a huge amount to the project. He didn't just act in the game but was our dramatic director, so he directed all of the cinematics while Tameen Antonaides (co-founder of Ninja Theory) directed the gameplay. But then Andy also bought a huge amount of other stuff to the game – he was involved in the story quite heavily, particularly the character art, he also did the casting which was done exactly like a film. He did workshops with all the actors who did complete read-throughs on set. They did a complete run through of the entire game acting it all out like a theatre production, so they really understood what they were doing, and he ran it like a film production in a really professional way. He brought a lot more to the team than just playing a character. Q: GamesIndustry.biz: Those high production values and attention to detail were praised in the finished game. That's important for Ninja Theory, to be quite lavish with the production of the game? Nina Kristensen: I think you can only do that if you've got professional talent from those other industries. It's something we did across the board, we brought people in from other industries and media who'd never worked in games. There's a company called Play It By Ear out in New York who do sound effects and they had never worked in games before. We worked with them on the sound effects – they actually did the sound effects for Crouching Tiger, Hidden Dragon. Q: GamesIndustry.biz: And that's a philosophy you're going to continue with future titles? Nina Kristensen: Absolutely. If you want to make something's that really high-end and really engaging if you get the best talents from each discipline and you're able to integrate them effectively into the game then you're going to get the best possible results. So there's a lot of these relationships that we very much intend to maintain going forwards with our new games. Q: GamesIndustry.biz: Are you working on a sequel to Heavenly Sword? Nina Kristensen: No we're not, we're working on a new IP. Q: GamesIndustry.biz: What can we expect from the new project – can we expect another three year production with a massive budget? Nina Kristensen: Yes, we're looking at doing something really big and ambitious and absolutely build on our strengths in storytelling, cinematics and combat. Nina Kristensen: There's always more stuff to learn but I think we know the PlayStation 3 very intimately now. We had to build everything from the ground up because when we started there simply wasn't any middleware or anything like that. Q: GamesIndustry.biz: Looking back would you say making Heavenly Sword exclusive to a single platform was the right decision to make or would you have preferred to see it on more formats? Nina Kristensen: It was nice to be a PlayStation 3 exclusive going in to new generation of consoles. From a practical standpoint it was very helpful for us to be able to get the most we could out of the PS3 at the time. Going forwards we are going cross-platform with this new game. Q: GamesIndustry.biz: My next question was are you looking at working with other publishers and other formats? Nina Kristensen: We're looking at several things. We're certainly targeting a triple-A blockbuster, with two and a half years in production. We're actually looking at something in addition to that - we're considering opportunities in creating a CGI movie using the game engine alongside the game itself. The game is certainly the most important thing and we haven't decided for sure to do this, but it's something we're looking at. It's an interesting idea. Nina Kristensen: I think there's a lot of opportunities there and it's something we'll be exploring over the next year or so. Q: GamesIndustry.biz: Are you interested in other routes to market? Because those games that take three year's to create are very time consuming and expensive. Do you see opportunities for Ninja Theory to take advantage of downloadable content or smaller development models – PSN of XBLA where team sizes are smaller, titles are cheaper to make? Nina Kristensen: It's very interesting but it's not something we're doing right now. It's something we might consider doing a little bit further down the track. Q: GamesIndustry.biz: There was a rash of indie developers being snapped up by publishers last year, and recently a number of smaller outfits have been forced to close. Is Ninja Theory confident it can remain comfortably independent in the coming months? Nina Kristensen: It's a brutal environment out there for an independent, particularly considering the size of the games that we're developing. But we've now signed up the new game and the future looks pretty rosy for us. Bioshock Coming To Playstation 3? Grand Theft Auto IV Scandal? Retro Employees Get Fired, Maybe.